* The smiley yellow one (which I added nori on the top) is called 'Bika Ambon'. This cake have a fascinating form of small holes in the surface and if the cake is cut, the texture appeared as a fine fiber bars. Taste is very delicious with aroma of fresh lemon leaves. * Sticky rice with chicken meat filling and wrapped in thin slice of egg sheet is called 'Semer Mendem'. * Sweet rice pudding with pearl sago and corns is called 'Tako'. This is similar to Thailand's traditional cake too. Maybe because Indonesia and Thailand are both in South East Asia, so some of the traditional cakes are similar. * Green flower cakes is called 'Putu Ayu'. I didn't make these traditional cakes by myself. I just went to the cake shop early in this morning and made a quick arrangement in the box. I like it! I love pink! The bento box is very unique in design. Thank you for sharing information about Indonesian traditions. I am fascinated with different cultures and customs so I love learn more. Oh my gosh, those are sooooo cute! You decorated and arranged them so beautifully. So cute that they have a share with your friend day. @Vanessa : I know the box is such a big box. Only an event like this then I can use this box. I have this habit to decide which box I will use for the bento and then thinking what will I fill in. So you are right ... I do measure the diameter with my pointer finger hahahaha :D Silly me. Great box. The cakes looks really neat and tasty. I really like the idea of a sharing day. It's so pretty! I love the layout of the box. Sharing with a friend sounds like a really fun thing for the kids! Thank you for telling us about the Indonesian cakes, they are so pretty and sound delicious! Such a magical, BEAUTIFUL bento, Lia! I loved reading about traditional Indonesian cakes and adore how you gave them your own sweet and happy decorations! how sweet is this!! like your arrangement, well done. WAH! i attracted by that Indonesia Traditional Cake. 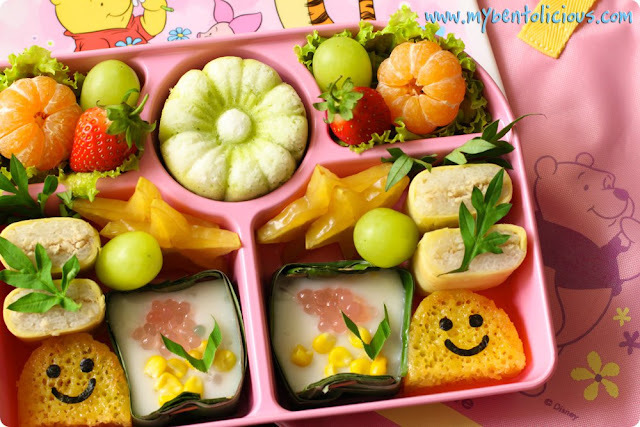 ur bento really creative & yummy. I'm so intrigued by the cakes, thanks for sharing. I worked as a waitress in two different Thai restaurants, and I'm trying to recall if I ever ate something similar to the Tako. hmmm..
Dear Bentolicious, you have a very playful site, energized and the colors made me feel happy. OMG! Incredible presentation. Loved your site, very professional. Photos were crisp and clear. Recipes concise and easy to read. I shall be back for a bite of more. @pTsaldari : Thanks a lot Gaby for visiting my blog and leave your nice comment :) I will hope to your blog. OMG Lia ... you make me feel so homesick right now ^.^ I miss all those mouth watering traditional Indonesian snacks. @Just a MOM : Hi Lina! How are you? It has been a while ... I thought you were back to Indonesia on December. Anyway nice to see your comment again :) Thanks a lot! Looking at the bento, how I wish I'm the one got shared it with ur kids in school :p U made the bento so pretty, very very creative! Great, you made me drool. Semar mendem oh semar mendem, I haven't eat that for ages. @Indonesia-Eats : Hayo! When you will back to Indonesia? share with mee pleaazee... hihihi! adorablee li!